For over 30 years, the roofing experts at Zenith have served throughout the Southwest United States. With extensive knowledge in all areas of commercial roofing, including installation, repairs, and maintenance, we are your go-to source for any roofing needs, large or small. Zenith Roofing is well-known nationally for our knowledge and expertise in commercial roofing applications. We have travelled throughout the United States with several roofing manufacturers and our nationally-based commercial clients to deliver top-notch roofing service. Our commitment to quality service and our unparalleled work ethic has allowed us to travel around the country and consistently deliver quality work in today’s competitive roofing market. 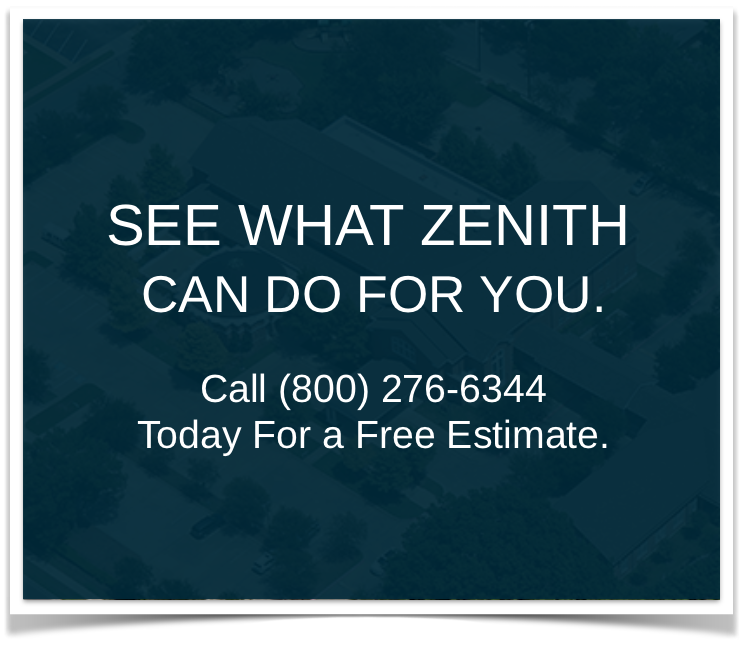 No matter what your commercial roofing needs may be, Zenith will exceed your expectations. One of the single most important things that you can do in order to maintain the longevity of your commercial building is to take care of your roof. Allowing common problems such as roof leaks, flashing deterioration, hail damage, or other storm damage to accumulate will cause your commercial roof to deteriorate more quickly, and can lead to serious internal damage to your commercial building. Therefore, it’s important to be proactive when it comes to caring for your roof and having a regular maintenance program in place. Maintenance and repairs require trained staff to identify what maintenance is required. Incorrect procedures not only affect the life expectancy of your roof but also allow potential structural and interior damage to occur. We have a high skill set and expertise when it comes to roof repair – skills developed over 30+ years in business and a commitment to the continuing education of our foremen and journeymen. We provide quality work that will hold up through even the harshest weather conditions and we provide you with a written guarantee. We will work with you closely to address all of your needs, answer any questions that you have, and provide you with the most value for your investment. We have hundreds of satisfied customers-both in the Dallas/Ft. Worth area and across the country who can provide valuable testimony to the quality of our roofing services. References can be provided with any proposal. Our experience and service are unsurpassed. If you would like more information about Commercial Roofing Services or are interested in any of the other services that we offer, call us today for a free roof evaluation. If your insurance carrier is involved in the repair process, click here for a comprehensive list of insurance claim department numbers.